The Skinny: During Japanese colonial rule, a plucky young woman pursues her lifelong dream to become a pilot in this competent, if unspectacular historical drama. The film boasts nice performances from its leads, beautiful art direction, and solid production values, but in its attempt to encapsulate the real life experiences of pilot Park Kyung-Won into the space of little more than two hours, the end product feels rushed, incomplete, and disappointingly lightweight. If any film was in need of an extended director's cut, this is it. 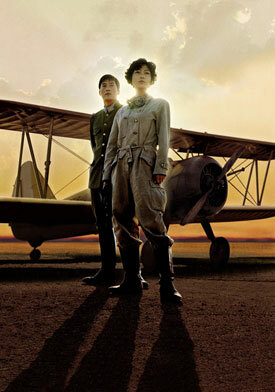 Written and directed by Yoon Jong-Chan, Blue Swallow is a pre-World War II era bio-pic based on the life of Park Kyung-Won, a woman cited as one of the first female Korean pilots to ever fly the friendly skies. Although that accomplishment alone should make her a hero in the eyes of Koreans, Park is, in some circles, considered a traitor to her country, as she was alleged to have happily endorsed a number of pro-imperialist causes for the Japanese. Director Yoon Jong-Chan tapped Jang Jin-Young, the leading lady from his previous film, Sorum, to portray this famous, if not outright infamous figure from Korean history. While Jang successfully humanizes Park, shedding light on what may have influenced her pro-Japanese stance, the film's politics end up being the least problematic aspect of the finished production. Raised in rural poverty, Park Kyung-Won flees Korea and heads to Japan in pursuit of her dream of becoming a pilot. Early on, she works as a taxi driver/mechanic in order to build up enough cash to attend a prestigious Japanese flight academy. While on the job, she meets a fellow Korean named Han Ji-Hyuk (Kim Joo-Hyuk), who she befriends not long before he is shipped off to the military by his disapproving father. In the meantime, Kyung Won enters the academy and comes under the tutelage of a respected flight instructor (Toru Nakamura) before inching her way up to the top spot among the other pilots. There, she butts heads with Gibe Masako (Yu Min), a daring Japanese pilot who also happens to be a woman. Of course, as one might expect, the two rivals become fast friends in dramatic fashion, as Gibe transforms overnight into a trusted ally in Kyung-Won's fight to earn the respect of her superiors. And soon enough, Ji-Hyuk returns from the military as a weather officer and is stationed in the same base as the flight academy. After introducing her to his adoring, adopted "sister" Lee Jung-Hee (Han Ji-Min), Ji-Hyuk and Kyong-Won embark on a secret affair. But when the young couple find themselves implicated in a pro-Korean conspiracy that results in the deaths of several prominent Japanese men, their whole world comes crashing down upon them. Blue Swallow beautifully re-imagines 1930s Japan with the use of splendid art direction and snazzy CGI-wizardry. The obviously high production values give everything in the film a glorious golden sheen, which at least from a purely visual standpoint, makes it a joy to watch. However, the computer enhanced biplane scenes are a bit embarrassing by modern standards, as they seem to resemble the now obvious fakery of similar sequences in early twentieth century Hollywood films, especially in close-up shots of Jang Jin-Young that look conspicuously as if they were shot on a soundstage. This lack of attention to detail is jarring, immediately taking the viewer out of the moment. This artificiality wouldn't matter as much if the story and the characters themselves had been more intricately drawn, but despite likeable performances from Jang and Kim, the movie moves at such a brisk pace that it's hard to get a sense of either the characters internal lives or their struggles. In fact, Kyung-Won's ascendancy from mechanic to flight student to full-fledged pilot moves at such breakneck speed that the achievement of such a revolutionary progression gets glossed over. It's as if the film is more or less a summary of Park Kyung-Won's career, rather than an attempt to replicate her actual lived experiences. Later in the film, the two leads are given a chance to flex their acting muscles as events turn dire, and as involving as that turn is, it's more or less too little, too late in terms of offering the viewer anything substantial by way of plot or characters. The film begins and ends with a sepia-toned frame detailing Kyung-Won's childhood love of planes. The finale is supposed to be operating in full tearjerker mode, but in flashing back between memory and reality, this overly-sentimental coda comes across as manipulative and downright cheesy, especially since many of the memories were withheld from the viewer until these final scenes. As a result, the memory invoked might actually have been better placed at the film's beginning since it would give a much clear sense of why Kyung-Won was so obsessed with flying in the first place. In the beginning, it would have come across as amusing rather than corny, as it is in its current position. In order to defuse the controversy surrounding its main character, the film posits that the allegedly pro-Japanese Park was not really a traitor to her people, but instead an apolitical person forced into a severely compromised situation. Within the fictionalized context of the film itself, her decision to continue to pursue her dream in the face of adversity seems entirely justified. What's curious, however, is how the anti-Korean, anti-female aspect of the narrative comes across as somewhat muted. Both are obstacles she has to overcome and we as audience members understand that completely from our modern vantage point, but as depicted, these "negatives" seem more or less like road bumps in her path to glory. As with the issue of pacing, without a more concentrated effort to show her struggles on the part of the filmmakers, her accomplishments seem far less important than they should be.